How the development would look. A stunning new vision for the transformation of a city market has been revealed. Following months of consultation, images of a nine-storey copper, glass and granite tower have emerged. The structure will replace the ageing Aberdeen Market building, towards the end of Union Street, and could help rejuvenate a once vibrant but now tired part of the city centre. Behind the plans are developers Patrizia, who will soon bring forward a separate scheme for the former BHS shopfront on the city’s famous retail street itself. The firm, formerly Rockspring, wants to demolish the indoor market and build a new “mixed use” building, comprising offices, bars and restaurants. The building would be copper clad and featured glass and granite elements which could be used for Nuart installations in future – perhaps a nod to the fact that the popular artwork on the existing building would be lost. Drawings show how the development could lift the entire area, with The Green apparently envisaged as a destination for markets and other events. How the re-development would look. The proposals have been submitted following a public consultation and an exhibition in November, with the developer claiming there broad backing for the removal of the old buildings, which have “deteriorated over time”. Progress has certainly been welcomed by business leaders in the city. 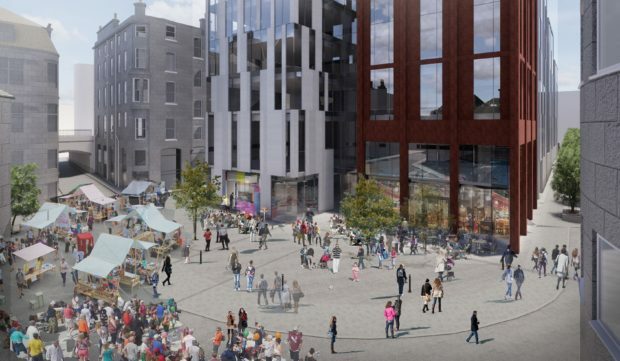 Russell Borthwick, chief executive of Aberdeen and Grampian Chamber of Commerce, said: “The indoor market is identified as a key project in the city centre masterplan. Redevelopment of the area will be yet another significant step forward in the ongoing transformation and revitalisation of our city. More than 50 people attended the consultation event, held in the old BHS building, while numerous others contacted the developer directly. Aberdeen City Centre Community Council said it looked forward to seeing the proposals in full. Dustin MacDonald, chairman, said: “The market area badly needs developed, but the devil is in the detail in terms of what is being proposed. A vision for the redevelopment of the former BHS shop front will be subject to a separate planning application. 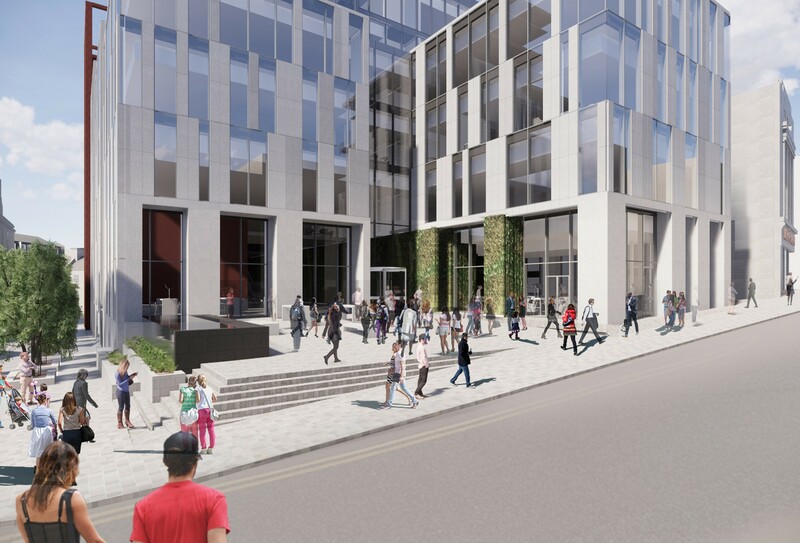 Developers have said that when fully occupied, the new business space will bring more than 1,000 people to the area daily, increasing footfall and benefitting city centre businesses. Shaun Hose, director of Patrizia, said: “Our plans have incorporated feedback from the public consultation and the council’s planning team. “We’re satisfied that we now have the best design and lay-out for the site – ones that match the public’s aspiration for the city centre and the current demand for different types of office space, retail and leisure outlets. “They will reinvigorate this part of Union Street, Hadden Street and the Green, injecting much needed diversity and vibrancy.